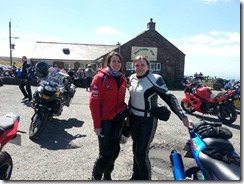 Ella one of our biker friends has taken on the Cafe Racer Challenge. So she came north for a change and joined us on a run around the Dales to enable her to bag three cafes in that area. We met Ella at Clitheroe Services after having her S1000RR in at BMW for a valve check, which was only completed that morning. Upon our arrival she informed us that the bike had leaked oil all over the place on the way there, even over her back tyre. After a quick check of the bike it looked obvious that it had come out of the camshaft cover gasket. BMW had replaced the gasket but obviously the gasket and sealant had sealed correctly. 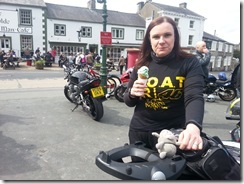 We had to wait at Clitheroe for about 1.5 hours for BMW to bring her a replacement bike for the day. We left Clitheroe just after 11:15am and headed straight for Devil’s Bridge via our tried an tested route of Sawley, Wigglesworth, Settle and Ingleton. We stopped at Devil’s Bridge briefly so Ella could take a photo and bag her first cafe of the day. We then headed north on the A683 towards Sedbergh and then joined B6256 which took us to the A684. We turned right and followed the A684 to the B6257 and then turned left and followed that road to the junction with the A685. Here we turned right and ran parallel with the M6 down into Tebay. We then joined the B6260 to Orton and then the B6261 which passes under the M6 and then joins the A6 just south of Shap. We headed through Shap on the A6 and followed that road all the way to Penrith. We then joined the A686 and headed towards Alston. This road meanders for a while until you get to Melmerby. Just as you leave Melmerby the real fun starts as you start the climb of Hartside Pass. This is a stunning bit of asphalt with some very tight turns and is reasonably steep in places, which means you can catch less powerful cars up very quickly indeed. We stopped at the top by Hartside Cafe briefly so Ella could bag her second cafe of the day. left Hartside and started the descent down into Alston, this side is not as challenging. 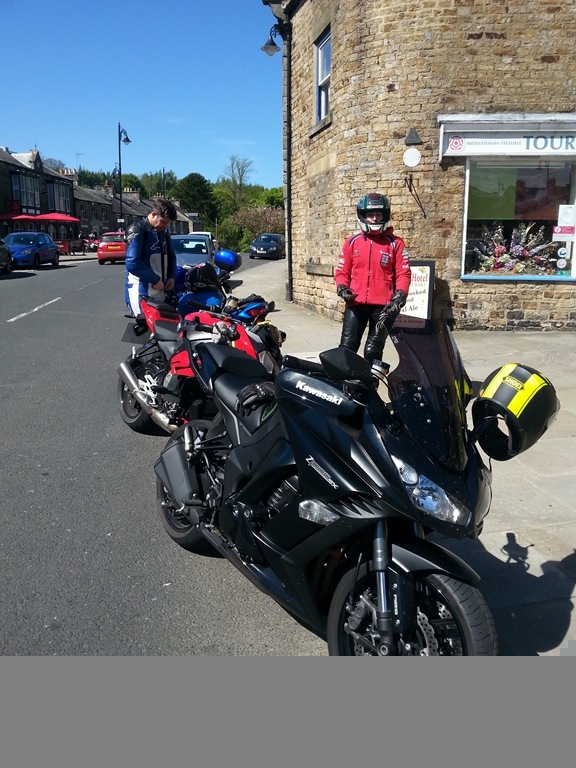 We stopped briefly in Alston for fuel and then joined the stunning B6277 to Middleton-in-Teesdale. This road is always quiet until you get near to High Force, the majority of the corners are open and provide superb vision. 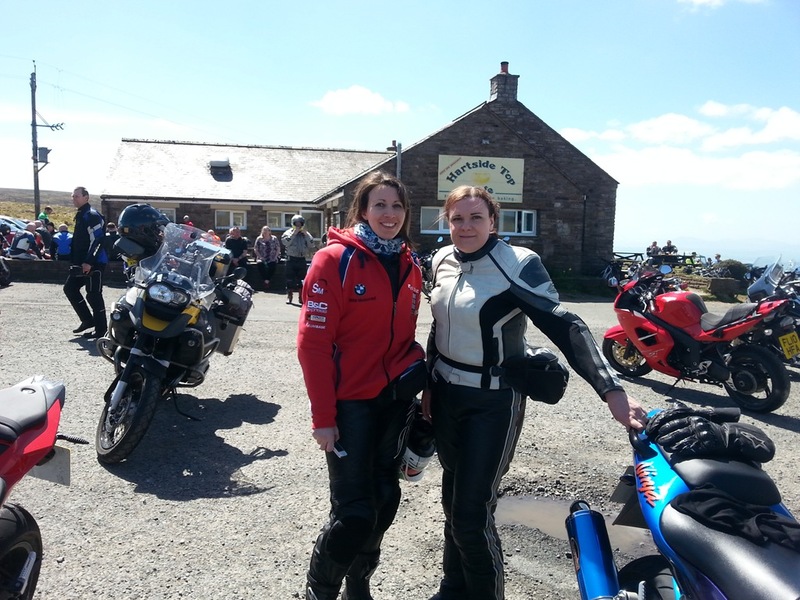 We had a great run to Middleton-in-Teesdale and then stopped at one of our usual haunts for lunch Cafe 1618. After a wonderful very late lunch we joined the equally superb B6276. This road is usually even quieter but is slightly more technical in places. The major concern is that you will often find suicidal sheep on this road in between the cattle grids. But once you are familiar with this road you know where they will likely be. We soon arrived in Brough and then followed the A685 to Kirkby Stephen. We then turned left in Kirkby Stephen and followed the B6259 through Nateby and Outgill to the A684 at The Moorcock Inn. 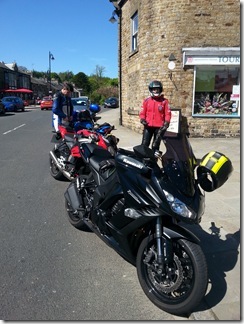 We then followed the A684 to Hawes so Ella could stop by the Penny Garth Cafe for her third cafe bagging of the day. From here we followed the usual suspects the B6255 and B6479 to Settle. We stopped in Settle for Coffee and Scones at the Ye Olde Naked Man Cafe. We then headed home by the usual route of Wigglesworth, Sawley and Sabden. Helen and I went out for a run today, due to it being a bank holiday I decided it would probably be a good idea to avoid most of the popular routes around the Dales and Cumbria. It was also a good chance to finish off my tyres and to test that the Garmin and bike to bike radios still worked. We started out and headed straight for Clitheroe. 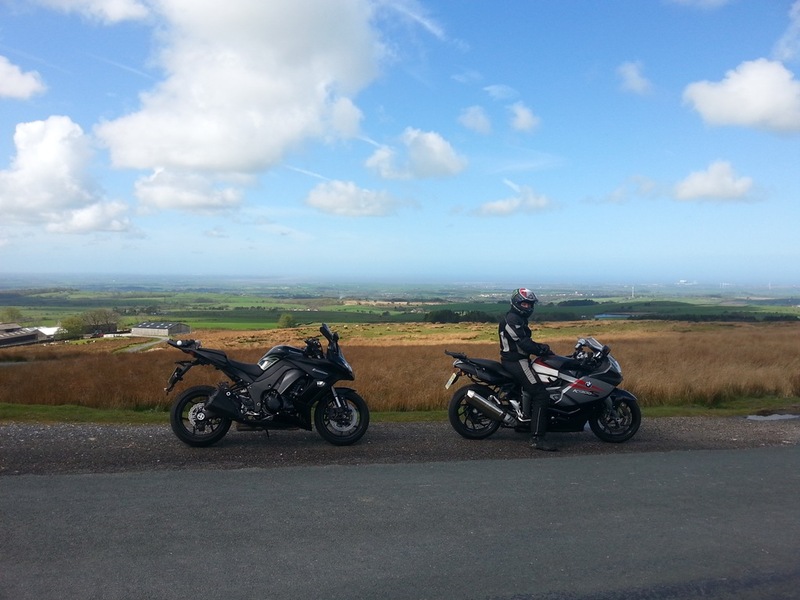 We then headed through Waddington and over Waddington Fell to Newton-in-Bowland. From here we turned left and headed to Dunsop Bridge and then turned onto the Trough of Bowland road and headed to Quernmore. We turned north and Quernmore and then joined the A683 at Caton. We then briefly followed the A683 to Hornby and then turned onto Fleet Lane and headed for the B6254. We turned right onto the B6254 and followed this all the way to Kirkby Lonsdale. This is the first time we have ever used this road and it was much quieter and probably better than taking the A683 all the way instead. We passed through Kirkby Lonsdale itself and then continued on the B6254 towards Kendal, again another nice quiet flowing road. Just before Kendal we turned right onto the single track Hayclose Lane and then passed over the A684 and followed the even tighter Paddy Lane to the A685. We then turned right and followed the A685 down into Tebay and then the B6250 to Orton. We stopped in Orton at Orton Scar Cafe formerly Silver Yard Cafe. After a lovely lunch as usual we joined the B6261 and followed that to the A685 and then headed for Kirkby Stephen. Just before Kirkby Stephen we turned onto Station Road and then joined the B6259 to Nateby. We passed through Nateby and followed the B6259 all the way to the junction with the A684 at The Moorcock Inn. We then followed the A684 to Hawes and then joined the superb B6255 to Ribblehead Viaduct. From here we joined the B6479 to Settle via Horton in Ribblesdale. 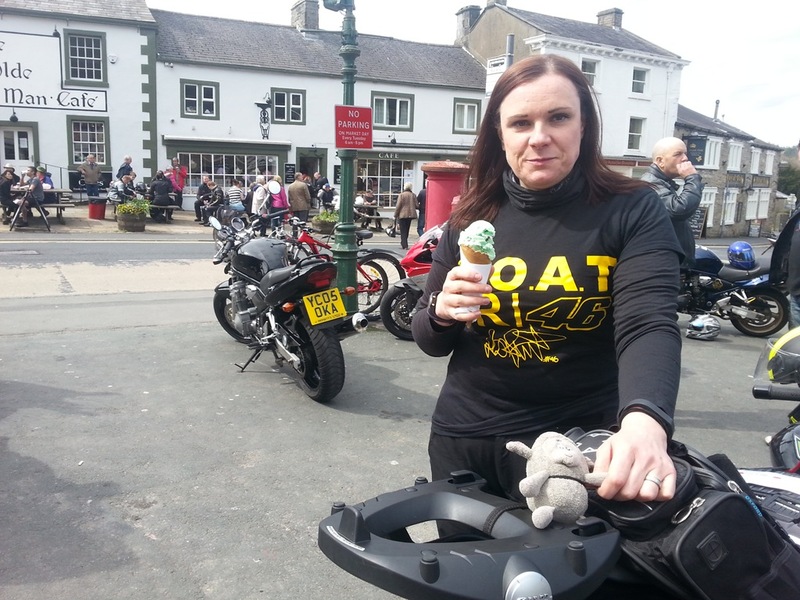 We stopped in Settle and got a well earned ice cream from our usual haunt the Ye Olde Naked Man Cafe. We then headed back home via our usual route of Wigglesworth, Sawley and Saben. The SatNav and radios both worked as they should and it would appear as suspected that the sound issue was down to my previous microphone. The only minor issue was the new microphone picked up wind noise easier and so was setting off the Vox for the radios when not intended. The easy solution to this is to put tape over the internal chinbar vents and and to turn the Vox sensitivity down on my Autocom unit. As previously discussed I have had numerous issues with the Pinlock visor insert on my HJC R-PHA10 Ben Spies Limited Edition helmet. I have gone through 3 of them now on both the clear and light smoke visors that I have. They have all work for a brief time than they develop a small gap and start moving about and actually then scratch the inside of the visor. Due to me actually liking the helmet otherwise, I decided to get a new light smoke visor and try Muc-Off Anti-Fog Treatment instead. I am happy to report that it seems to work really well and I didn’t have any fogging issues on a recent ride, when Helen experience some with her own Pinlock insert on her Shoei helmet. On our tour last year my Microphone got very wet going through Andorra and then started to play up for the rest of the tour. So I decided to get a replacement microphone to see if that was the actual issue with my Autocom system. The microphone I got was slightly different from the original and is in my opinion far better as well. The boom is far more flexible and holds its position so I can position in front of my mouth rather than having to velcro it to the helmet chin bar. The microphone worked great although it is now setting off the Vox with wind noise, so I might need to adjust the Vox setting, not easy because of my install. 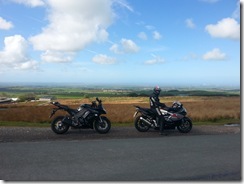 I took the BMW for its well overdue MOT the other day to Bikes and Beyond in Shaw. The throttle misbehaved a bit as usual but he was happy to pass it regardless as it seemed pretty obvious it is not connected to the actual throttle and cable. I still think it is electrical and either the stepper motor or the idle control valve. I am intending to trade it in after our upcoming tour for a newer one as the expensive valve check will also be due soon as well. I got an advisory for the rear tyre and the headlight beam failed initially as it was too low. But they sorted that with the adjuster and passed it with flying colours otherwise. Other than that the bike ran very well considering it has really moved since last year.